Argentina beat Ireland 33-20 in the quarter final and Ireland’s quarterfinal jinx continue for atleast another 4 years. Pumas started the match in superb fashion taking 17-0 lead within first 20 odd minutes. But Ireland’s comeback was not enough to stop the pumas making it three southern hemisphere teams in the semifinals and Australia might join them to make it 4 out of 4. Matias Moroni and Juan Imhoff helped Argentina to a impressive 17-0 lead within first 10 minutes and it looked like curtains off for Ireland. But Irish team fought back and reduce the deficit to just 10 points at the break with Luke Fitzgerald scoring a try for Ireland. Teams went into the break with Argentina leading 20-10 but Ireland dominated the second half and a try early after the break from Jordi Murphy brought the game back in balance with Ireland 17-20 Argentina. Argentina however increased their lead just when Ireland looked like closing in, Tuculet raced down the wing and beat 2v1 situation to score Argentina try and take the scores to 33-20 and pretty much end the contest with 10 minutes to go. Ireland had a decent world cup until this point and they were labeled as favorites against Argentina in the quarterfinals but La Pumas had different ideas. Ireland go out in quarter final stage once more. 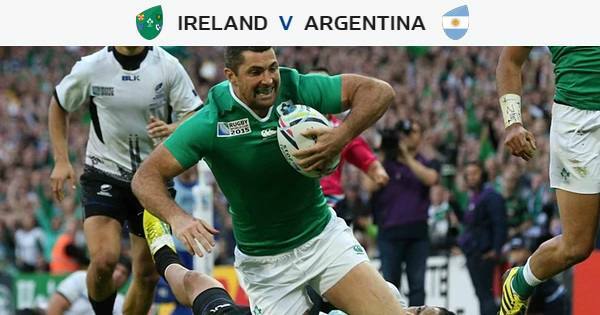 Ireland vs Argentina Preview & Team News: Ireland has a great chance of winning their very first Rugby World Cup quarter final when they take on Argentina in what should be quarter final. Irish rugby team has improved alot in last few years and this is their chance to finally break the jixn of quarter final exits. Argentina has had a great world cup so far and they will fancy their chances to reach semifinal for the only second time in their history, last time being 8 years ago in 2007. Looking at the head to head record in the world cups, Both teams have played three time against each other in world cup history with Argentina winning two and Ireland getting 1 win. Ireland have some injury worries going into the fixture and here is team news from both camps. Henderson is expected to replace legendary Paul O’Connell in the Ireland lineup. O’Connell announced his retirement after suffering injury in the pool game. Santiago Cordero will be player to watch for Argentina who has scored three ties so far, twice against Georgia and 1 against Tonga in the pool games.